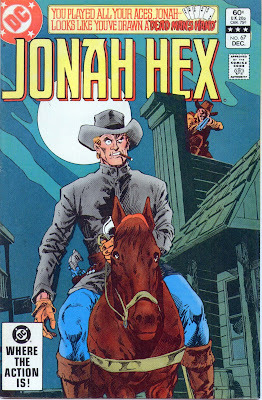 Matching Dragoons: Jonah Hex #67 "Deadman's Hand!" I wonder if Michael Fleischer had any idea that 25 years after he wrote this book someone would go back and track his made up newspaper date to see what year it was in...and then talk trash about him for not putting the story in the right year. Goodness Gracious! I'd NEVER prance around in front of an open window wearing a man's hat! I'd be too exhausted from wearing a chemise, drawers, corset, corset cover, bustle, and several petticoats...and that's just my underwear! 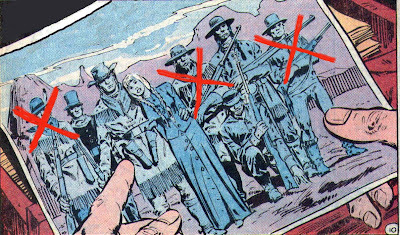 Sally, I would LOVE for you to draw a comic of a lady from the 1800's getting undressed. It would probably cover more issues than Final Crisis. Come to think of it, that could be the title as well. Jord, I'm not really pinning the newspaper on Fleisher, it might have been the artist's doing. "...using two bullets, since lead was cheap back in the day..."
Eddie, Eddie, Eddie, Eddie, Eddie. What will we EVER do with you? If you MUST read ahead of the rest of the class, please don't jump up and become the Mayor of Spoilerville. You're the kinds guy that stands in the theater lobby waiting to see Titanic and says "I can't wait to see the ship sink!" :) I'm sorry. The ship sank??? It is really just a matter of me doing my timeline and trying to help out. :) It can be a bugger at times that's for sure. Seriously, your recaps and my own reading helps to put things together as I get other "outlooks". My biggest thing now is Jonah's birth "year". All this time we may all be a year late.